Winn Company and The California State Pension, developers of the Columbus Center project over the Massachusetts Turnpike, have agreed to a settlement payment of $5.5 million to Boston, MA, according to The Boston Globe. The settlement money is to be used towards the restoration of a parking lot(Bad) across from 33 Restaurant, and green space(Good), both located next to The Albert Pope Building at 221 Columbus between Berkley and Clarendon. 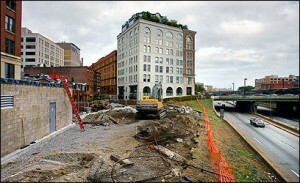 The building is well known for its luxury condos and one of Boston’s best restaurants, Mistral. The “Air Rights” project would have added retail, apartments, condos, green space and most importantly, a cap over the eyesore we call the Turnpike which causes all sorts of noise and air pollution to residents of certain parts of the Back Bay and South End of Boston. Luxury Residential Group advice to the State – go forward with capping the highway and build a beautiful, tree lined green space that will hopefully be the home of a great dog park, jungle gyms for kids to play on, a relaxing seating area for those outdoor Back Bay lunch breaks, and hopefully bring enjoyment, life and positive energy to an otherwise grey, noisy and downright unattractive part of town. This will also help create a vibrant, active area of Boston that will help bridge The South End and Back Bay.